The popular tradition continues as Up All Night celebrates the end of the fall semester! Join us for food, fun and games in Union Building East. The event is free for all UTEP students! Activities include a stress free zone, a Wii U gaming tournament and a small workout room. A canned food drive benefitting a local food bank will kickoff the night's festivities. Students who donate at least four cans of food will receive a free UTEP T-shirt! There will be a showing of one of the year's top blockbusters at 7 p.m. in the Union Cinema. 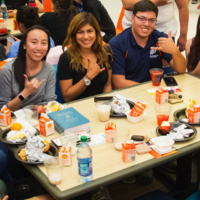 Faculty, staff, and Student Government Association volunteers will serve a free breakfast at 9 p.m.
Jamba Juice and Starbucks will also be open through 10 p.m.